At evian, we know that drinking water is the healthiest form of hydration. That’s why we’re helping consumers to develop healthier drinking habits through our products and services. At the heart of our approach is our core belief: by helping people get the right hydration every day, we are fueling healthier lives. Water is necessary for our good biological functioning. It is vital to the make-up of cells and tissues, the transportation of nutrients, waste elimination, regulating the body’s temperature and maintaining optimal cognitive performance. At least 2 litres of water from all sources should be consumed per day to obtain those effects on our body. Our goal: make evian natural mineral water the first choice for healthier drinking habits throughout the day by offering services and innovations that expand access to evian water and make life easier for all our consumers. evian has one of the lowest mineral contents (less than 500 mg per litre) on the market, and offers the ideal mineral content for absorption by the weakest kidneys. This unique composition and neutral pH make evian natural mineral water the ideal daily partner for everyone throughout their life. It is particularly recommended for expectant and breastfeeding mothers, and babies. evian supports WHO recommendations for breastfeeding during a child’s first 6 months. The history of evian natural mineral water dates back to 1789 with Count Jean-Charles de Laizer’s discovery of a water he considered to be “light, pleasant and easily drinkable” in Gabriel Cachat’s garden. The Count, who suffered from kidney disease, noticed that his health improved after repeatedly drinking the water. Word of its benefits spread and in 1798, sales to thermal spa visitors began. In 1806, the first thermal spa opened, followed in 1826 by the first bottling facility. With thermal spas very much in vogue, an 1865 decree authorised the town to be renamed Evian-les-Bains. In 1878, the health benefits of evian natural mineral water were recognised by the French Academy of Medicine. Evian-les-Bains became a fashionable thermal spa destination and evian water enjoys its first successes. evian has been supporting sport for many years, sponsoring major international tennis events such as The Championships Wimbledon and the US Open, or golf tournaments like The Evian Championships. evian promotes the importance of hydration, sport and a “Live young” spirit as essential for a healthy and balanced lifestyle. 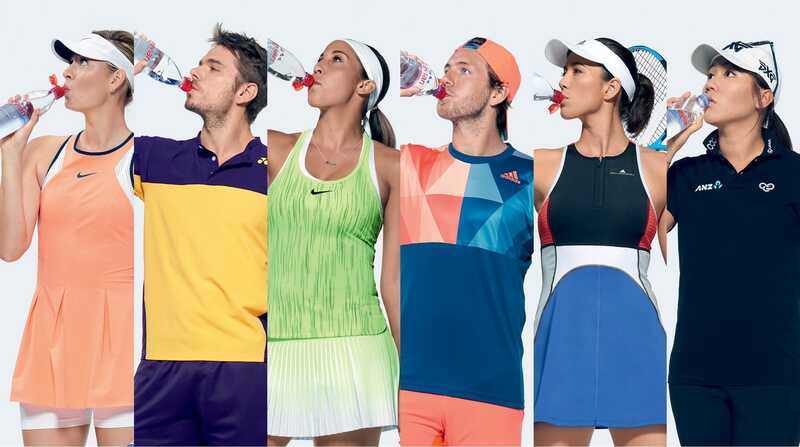 evian’s team of Ambassadors embody this spirit, including: Maria Sharapova, Stan Wawrinka, Lydia Ko, Lucas Pouille, Madison Keys and this year, introducing our new “Live young” ambassador, Garbiňe Muguruza.